City in the hill-country of Judah (Josh. xv. 49), situated to the south of Hebron (x. 38), on a prominence not very far from that city (ib. xv. 15). It was the former name of Debir (ib. xv. 15; Judges i. 11), and was also known as "Kirjath-sannah" (Josh. xv. 49), for which the Septuagint gives πόλιç γραμμάτων ("city of letters"), the usual translation of "Kirjath-sepher." 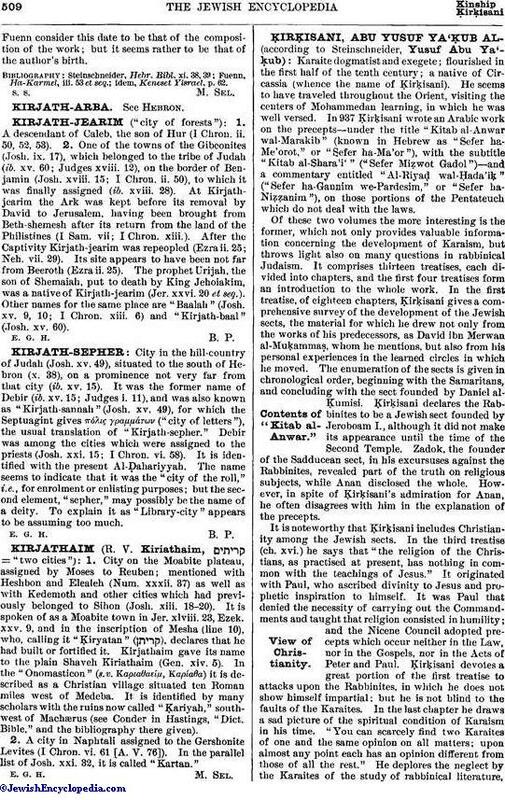 Debir was among the cities which were assigned to the priests (Josh. xxi. 15; I Chron. vi. 58). It is identified with the present Al-Ḍahariyyah. The name seems to indicate that it was the "city of the roll," i.e., for enrolment or enlisting purposes; but the second element, "sepher," may possibly be the name of a deity. To explain it as "Library-city" appears to be assuming too much.